← Gator Nation, Are you ready for Texas A&M? Pop Quiz, hot shot. Quick, name the last “big” game Florida won before this past weekend? Take your time. Think hard. You say “Ohio State in the bowl game last year”? Please. Tennessee? The Vols were 5-7 last year. Going back to 2010, what about the Georgia game? You remember, the only overtime game in the series, won on the unlikely boot of Chas Henry? The Bulldogs finished that year 6-7. You legitimately have to go back to 2009 against LSU when a recently concussed Tim Tebow helped the Gators escape Death Valley with a gut-check 13-3 win. I hope you enjoyed Saturday, it was a long time coming. As Our Two Bits resident pessimist optimist, I never doubted our ability to go into hostile territory and come out on top. As I predicted in the preseason the Gators would beat the Aggies. I also wrote about the leap that Jeff Driskel could make, emulating former Gators in their sophomore seasons. And despite the team’s struggles in the first half in College Station, you had to feel good only being down seven after the performance of RGIII Johnny Manziel. For the first time in the Will Muschamp era, the Gators coaching staff stepped up. They made adjustments in the defensive scheme to limit the lanes Manziel had to run in. They tightened up the coverage in the secondary, putting the corners and nickel backs in press position and forcing Manziel to fit balls into tighter windows. And on offense, the mixed up the inside and outside game just enough to consistently move the chains and push across a couple of scores in the second half to eke out the win. I hope Muschamp gave himself and his staff a game ball after their performance in the second half. This coaching staff hit puberty on Saturday and put a little fuzz on its sack. The confidence the Gators gained from passing a test for the first time in Muschamp’s reign should help on the path back to greatness. But there is still such a long way to go. And the road is only going to get tougher, starting with the trip to Knoxville this weekend. The losses of Jelani Jenkins and Cody Riggs will test the depth on defense. More troubling is the groin strain of Mike Gillislee. Even if he thinks he’ll be OK and the coaches think he’ll be OK, that’s the kind of injury that can hamper and stay with a running back for a long time. Gillislee is the one player Florida can’t live without. They have to get some production from him to have a chance against an improving Volunteer squad. If Driskel continues to make strides, if the receivers can make some plays (Frankie Hammond needs to give Deonte Thompson his hands back) and Gilly plays, the Gators will put points on the board. It’ll be on the defense to slow down Tyler Bray and the Vols attack with a consistent pass rush, strong inside play from Antonio Morrison and Michael Taylor filling in for Jenkins and an agressive and sound secondary. We have good history in this rivalry, winning seven straight, including three straight in Knoxville. Sonny Beam and I have personally seen some great things in Neyland Stadium. That’s me, front page of the Knoxville paper, day after Danny Wuerrfel and the Gators rolled Peyton Manning and the Vols in ’96. Sonny Beam is grinning behind me. Sonny and I were 2-0 as undergrads at Neyland. But despite the big win feel to last week’s game, Texas A&M wasn’t ranked and might not be all season. 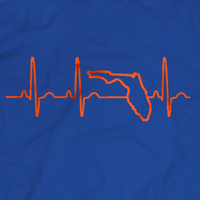 The Gators streak is still alive – 0-9 in their last nine games against the AP Top 25, getting outscored 268-115. And Tennessee is #23 in this week’s AP poll. 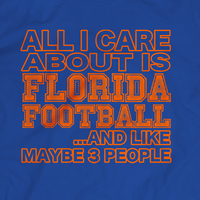 This entry was posted in Uncategorized and tagged big wins, Florida Gators, Top 25. Bookmark the permalink.